Part of this comes from the fact that there is, comparative to other Christian churches, very little Mormon liturgy, and what we have we have adapted to make it as efficient as possible. 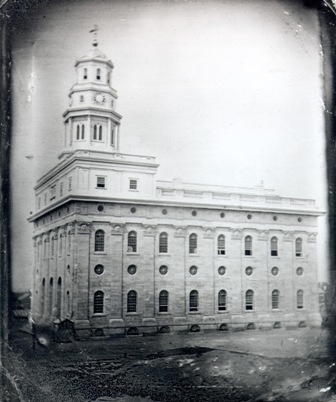 Most temples do not have the early four-room progressive endowment session (exemplified by the Salt Lake Temple), favoring instead a two-room design that allows for two sessions to go on at once (as well as a symbolic change in lighting and the appearance of the veil in the second room). Moreover, despite the performance of sacred, central ordinances in LDS meetinghouses, these ordinances are rarely architecturally central. The majority of the buildings’ floor area is taken up by offices and classrooms, while in the chapels themselves the focal point is taken up not by a Sacramental altar but by the pulpit (note how in cathedrals and the like the pulpit is off to the side and the Eucharistic altar takes center stage). Baptismal fonts, more often than not, are disguised as closets. Another element of absurd Mormon practicality is the fashion in which church design is envisioned. I still remember the March 2006 Ensign, wherein the Church announced new, multistory urban chapels, the exteriors of which were given architectural features determined to be cues to the buildings’ religious nature. Yes, the architects chose elements—like rose windows, vertical and horizontal divisions, prominent towers and entryways—which had evolved naturally over centuries until in the popular psyche they said “church,” and then applied them to Mormon chapels wherein they were entirely, and quite hilariously, out of context. Many of those motifs had had theological or liturgical significance in their original incarnations, and the exterior, especially of Gothic cathedrals (from which many of these architectural cues originate), was made to reflect the interior of the building and the rites performed therein. When I got the chance to visit one of these LDS meetinghouses in NYC this February, I laughed at how incongruous the design was: exterior windows, running up four floors, had nothing to do with the rather typical layout inside, and the pseudo-rose window opened into the gymnasium! 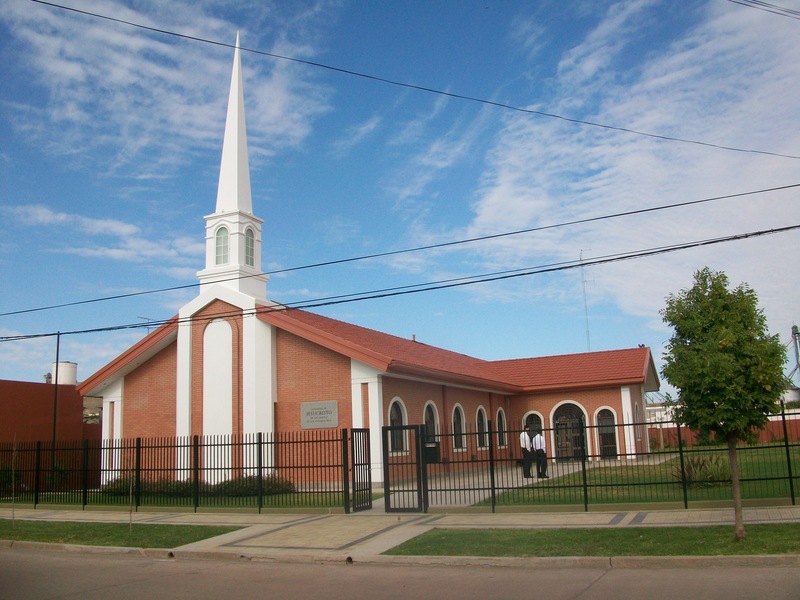 Typical LDS Church in Argentina. 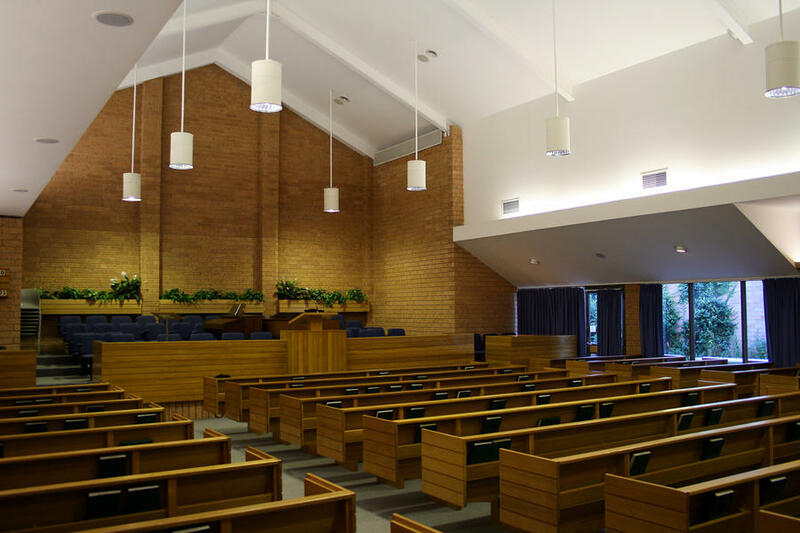 Interestingly enough, the LDS Church recently seems to be putting a greater emphasis on placing spires on meetinghouses, perhaps in an effort to be identified as a Christian denomination. My local ward got a steeple a few years back, and now it no longer looks like a medical practice. However, this strategy can backfire in different cultural contexts. In Argentina, where I served my mission, there was no tradition of steepled country churches, and the Mormon churches were literally the only churches with steeples. I cannot tell you how many times I had to explain that in the United States, where these designs were conceived, a steeple is shorthand for “church”! To the typical Argentine viewer of Mormon churches, the spire marked them as something foreign. So Mormon architecture is significantly, perhaps predominantly, influenced by conceptions of how religious architecture should look, emerging from American (and European) religious history. It would be hard to ascribe some sort of uniquely Mormon theological, cultural, or sexual significance to temple spires that are not adopted and adapted from surrounding styles. That said, let’s problematize the issue of gendered architectural discourse. To see the temple spire as a phallus might not be phallomanic, but it is certainly phallocentric; however,the temple itself is an ambiguously gendered space. While the endowment is the locus of the most dramatic example of ritual gender differentiation in Mormon liturgy, it (and the preceding initiatory ordinances) are also the locus of the greatest questioning of traditional gender norms, wherein women perform priesthood ordinances and are hailed as queens and priestesses. Since 1894, the sealing ordinance has represented the union of the generations as well as the sexes, sacralizing the biological ties that bind, The baptistery is a figurative womb/tomb in which the dead are reborn/resurrected to new life in Christ. Add this to the female identification of the earth, under whose surface the baptistery is traditionally located. This interior gender indeterminacy and unity spills out onto the exterior. The theory of the temple spire as a phallus can be disturbed by contextualizing it in the surrounding architecture; no temple is merely a singular spire. 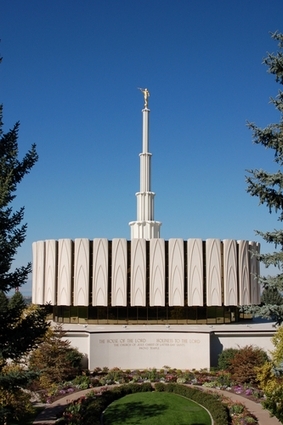 There are many Mormon temples that have more than one spire, as well as some that have none. Of those with multiple, we have the Salt Lake and DC temples with their six-spire design inspired. As overt symbols of the organization of the (male) priesthood, these are probably the closest to fulfilling Knowlton’s evaluations. 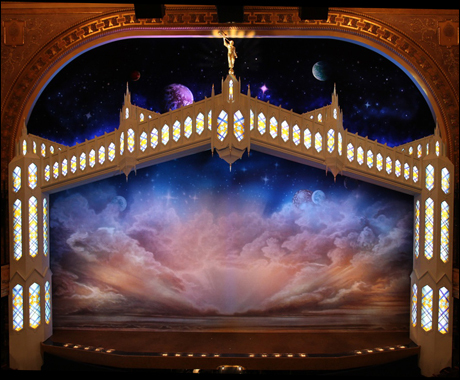 They seem to be inspired by the podium arrangement originally used in the Kirtland Temple, in which the presidency of the Melchizedek Priesthood would face across the hall to the presidency of the Aaronic Priesthood. If indeed the sets of spires are intended as symbols of the First Presidency and the Presiding Bishopric, it is possible to read each spire as representing a male figure. However, temples with two, one, or no spires are harder to place, not to speak of the five-spire Oakland or Cochabamba Temples. How are we to see Laie Hawai‘i; Cardston Alberta; or Mesa Arizona? Certainly, we could take a page from typically highly-gendered architectural discourse and talk about their robustness, muscularity, or solidity in masculine terms; but just the same, those terms could be applied equally well to plenty of women. There is nothing phallic about them. The increasingly popular two-spire design, in which a spire crowns each end of the building along the longer axis, could be seen as a six-spire shorthand, the spikes representing the Aaronic or Melchizedek Priesthood. But the unstable gender ambiguity of the priesthood inside the temple makes a superficial analysis unadvisable. What are we to say of the Rome Italy Temple, whose double spires top a structure that has broken with the vast majority of temple designs and incorporated significant curves, the temple’s body enclosed by nearly parenthetical walls? Rome Italy Temple. I LOVE this design. Provo Utah Temple. 1960s feminist statement? The spires of the Provo Temple and the (old) Ogden Temple, furthermore, are represented as fountains spouting forth from the round body of the building: could these not signify the breasts of the Mother Church (a common Christian theme not absent from Mormon thought), whence we derive our nourishment in our childlike earthly sojourn? Besides, why should it be repulsive to imagine the Gospel, preached by Moroni atop the spire, as the sperm that fertilizes the dormant ovum in each human spirit to turn us into gods in embryo (especially within the uterine confines of the temple), and the Church as the mother’s womb that shelters that fetus until its eternal rebirth? In this way, I believe the temple could be seen as a celebration of both sexes. No spires in Argentina? Really? Yes, really! A Google search will show you the cathedrals but won’t show you the parishes or Evangelical temples. 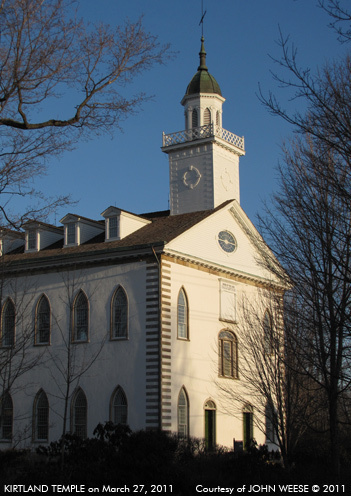 In my entire mission region, there were probably a only a handful of non-Mormon religious buildings with anything similar to a steeple–especially a steeple shaped, placed, and designed like Mormon ones, which are obviously intended /not/ to echo the cathedral towers of Spain or Germany but rather the Protestant country churches of the US. My immediate thought too. Argentines are European (Spanish) in ancestry as well as architecture. Had to take this article with a grain of salt after reading that. If anything, the befuddled Argentines who questioned the steeple were ignorant of religious architectural language. Of course they were. 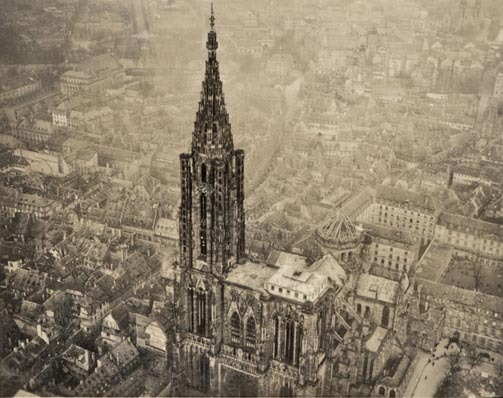 And part of the reason for that ignorance was the total lack of churches with steeples (and near-total lack of churches with prominent spires) in the region where I served, contrary to the United States. Note, too, that Protestant and Mormon steeples are often centered, on the peak of the roof; Catholic ones most often flank the entrance. While the Ogden and Provo sister temples shared the same general architecture, there were exterior hints as to the symbolism. The architect also made clear his intentions in published statements. I have not researched the original Provo Temple’s symbolism that you mentioned was a fountain. But I know Ogden’s temple was symbolic of the pillar of fire and the cloud that the Israelites followed through the wilderness. Looking at it through that lens, it is beautiful.